This has been an up and down season for tomatoes. A cool, wet spring and early summer slowed down growth, probably caused an increased incidence of blossom end rot and may have led to around a third of our 25 plants showing what may be a mosaic viral disease and never developing or bearing tomatoes properly. Fortunately, we planted 9 cocktail plants in 8 varieties and only one of them had that blossom end rot problem early in the summer and it has diminished as the weather improved. 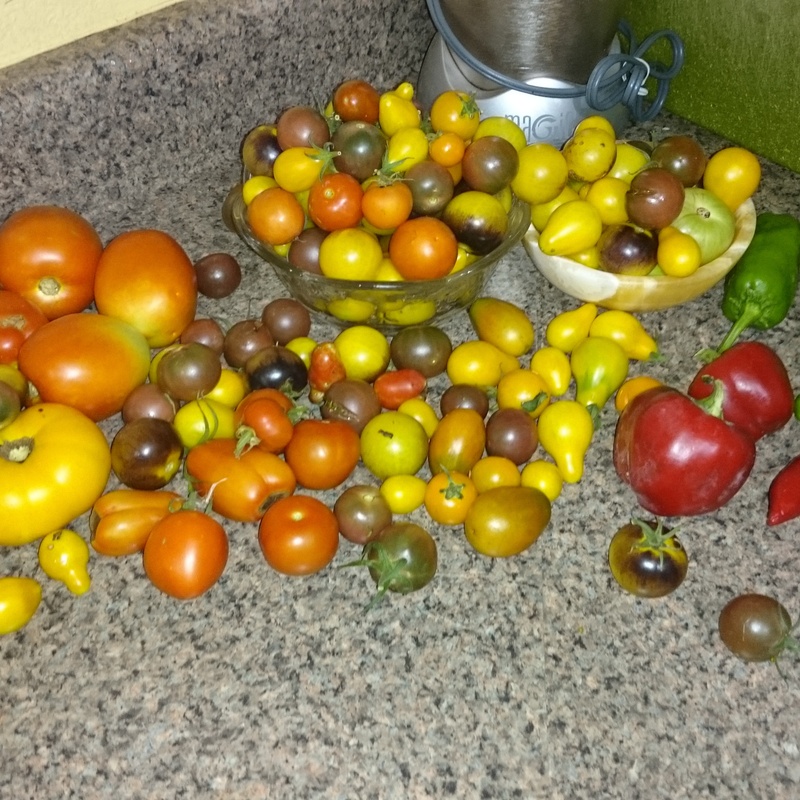 Since moving to Colorado I’ve always planted lots of cocktail tomatoes preferring a mix of heirloom varieties. Because of the shorter, cooler summers in Colorado, large tomatoes often don’t ripen until August and September. When I was learning to grow tomatoes as a boy in Missouri, our goal was to pick ripe tomatoes by the 4th of July and we usually managed to do that. By growing cocktails that ripen much sooner than traditional larger tomatoes, we were picking ripe tomatoes by mid-July here in Colorado. I have a long history with growing tomatoes. When I was a boy our family had a large garden with 500 tomato plants as well as other vegetables. My parents both grew up on truck farms and producing much of our own food was an important family value. We froze and canned lots of our produce but my brother and I also had a tomato stand to raise money. We were allowed to keep all the money from sales but were required to work in the garden every morning. I remember getting up at 6am and picking up to 15 five-gallon buckets of tomatoes. My grandfather would watch our stand in the afternoons while I spent time at the swimming pool where our family had a membership. We sold our tomatoes for 3 to 10 pounds per dollar, depending on the time of the season and current local prices. My brother and I made and split as much as $1000 a summer with our tomato business. That was when I learned how to work hard and grow a garden. Tomatoes like warm soil and the cool nights we have in Colorado, even in mid-summer are a big factor in delaying production of ripe tomatoes compared to the climate in the Midwest where I grew up. One way I’ve compensated for that in the past is to grow cocktail tomatoes in large black plastic pots that are 3 feet in diameter. Our bright sun here heats up the soil in these pots faster than the ground, helping those tomatoes to produce ripe fruits earlier than plants in the ground garden. In very hot summers, these potted tomatoes may burn up and reduce production in late summer and fall but are a nice compliment to a ground garden in prolonging the ripe tomato season by yielding ripe tomatoes weeks earlier than plants in the ground. I’ve also moved those potted plants into a greenhouse in the fall and picked ripe tomatoes into the New Year. Cocktail tomatoes bear heavily as well as early and planting a large portion of our garden with these varieties has saved our production this year. We have been eating tomatoes every day in our salads for 2 months now as well as using them in cooking whenever we desire. My wife, Cathy, has canned a batch of sugar-free catsup using stevia as a sweetener to satisfy my desire for catsup while reducing my sugar consumption since commercial catsups have plenty of added sugar. We have also frozen 10 and a half gallons of tomatoes for use this winter. I’ve frozen tomatoes for years and believe that preserves fresh tomato flavor for cooking better than canning. We don’t bother to scald and peel tomatoes as the peels contain valuable fiber and antioxidants that are a healthy part of our diet. It is easy to thaw and blend tomatoes for use in cooking although sometimes Cathy will toss frozen tomatoes into a cooking dish and then use a tongs and scissors to chop them up as they thaw. Perhaps our most innovative use for tomatoes is with making our own salad dressing. As a person who doesn’t like vinegar, ranch or mayonnaise, I’ve always had trouble finding any salad dressing that I like. We have been blending tomatoes, onions, garlic, peppers, tomatillos sometimes with various herbs and then adding olive oil to create a delightful salad dressing with a fresh tomato taste. We plan to use our frozen tomatoes to continue making salad dressing this winter. As someone who has always liked green salsa, it is somewhat surprising that last year was the first time I ever grew my own tomatillos. We have been adding chopped tomatillos to our salads creating great flavor and a crunchy texture that has led to them becoming one of my favorite fresh garden vegetables. We’ve canned a batch of green salsa and have a gallon of tomatillos in the freezer. Tomatillos will always be a part of my garden in the future. While I haven’t done it this year, I also have several vintages of tomato wine in our cellar. The best version of that was fermented with onions, garlic, bell pepper, basil and oregano. I named it Tomato Italiano and it is a delightful wine with a taste like marinara sauce. I’ve used it as a substitute for vinegar in creating salad dressings. The most fun I’ve had with tomato wine is when I served that wine as a cocktail at a wine tasting party. I served it with a cocktail sword piercing a mini venison meatball and a cherry tomato placed in the glass. I had introduced that wine previously to a group of friends in a blind tasting, asking them if they could guess what it was made from. Several wanted me to call it spaghetti wine but a good friend who knows my wines well was mystified. He finally asked if there was meat in it. After we all laughed and I revealed the ingredients he said the only thing missing was a meatball. In his honor, I named that cocktail, Matt’s Meatball Martini. Perhaps the prettiest tomato we’ve grown this year is a new variety for me, Indigo Sun. 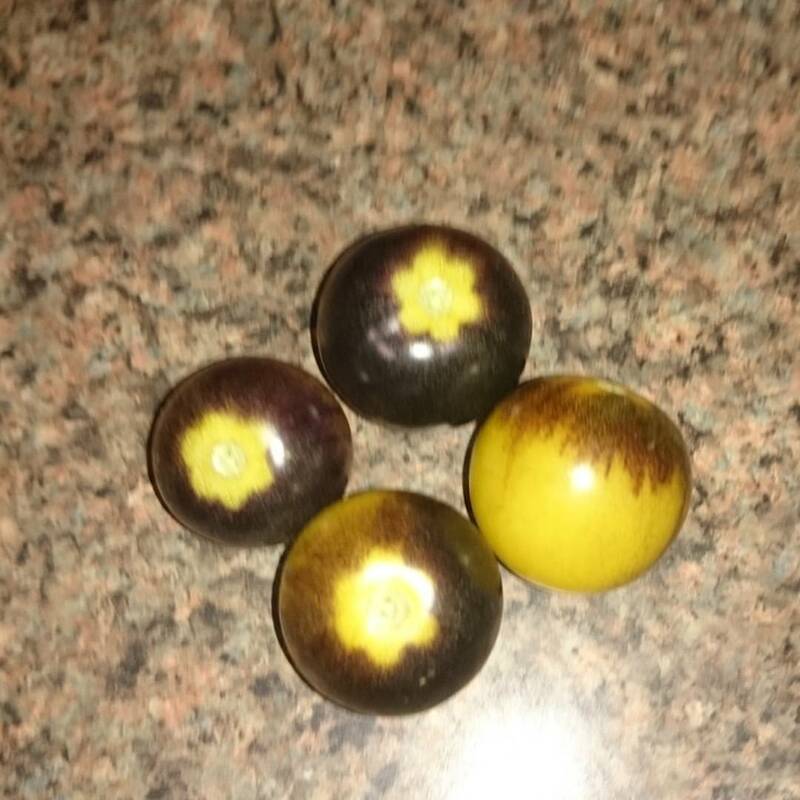 A cocktail with purple shoulders over a golden globe, when the stem cap is removed it exposes a yellow star where the cap protected the tomato from the sun. The purple coloration indicates a high level of anthocyanin which is an antioxidant flavonoid better known from blueberries, elderberries and other purple foods that have great health benefits in one’s diet. This is in addition to the well known benefits of lycopene, the main flavonoid found in tomatoes. While we have had some issues in our garden this year, I have to be satisfied with our tomato and tomatillo production. Our garden has done well this year. Our peppers in particular are spectacular. We’ve had enough peppers ripening to be able to use fresh ripe peppers daily and the plants are loaded with green peppers. Out of more than a dozen varieties, shishito is a new one for me that we find especially pleasing. We first came across shishitos in a restaurant in the Hamptons last summer and have since had them in high end restaurants in San Jose, Los Angeles and here in Fort Collins. We were excited to see plants available at one of our local nurseries and planted two of them. Not only do they bear heavily, but they ripen early and we have been eating them regularly, either sautéed by themselves or added to dishes. We really like the green shishitos we’ve had in restaurants, but ripe red ones are even better. I believe we will plant more than 2 next year. I’m growing 2 new(for me) superhot varieties this year to use in my series of hot pepper/citrus wines. The chocolate habaneros have begun to ripen and I may have already picked enough for a 10 gallon batch of wine with plenty of peppers still growing on 3 bushes. I’m going to pair these with Mandarin oranges and cocoa bean hulls to make Mandarin Chocolate Chocolate Habanero wine. The other variety is called brain strain which some have described as possibly the hottest pepper in existence. I will have to be careful with this one. Our 4 plants are full of peppers and the first ones are turning ripe. They are destined to become a batch of Tangerine Brain Strain wine. This sounds like a psychedelic 60’s experience which seems appropriate after reading descriptions of how this incredibly hot pepper earned its name. My ghost pepper plant last year didn’t produce much so I purchased some ghost peppers that will be used in an Orange Ghost wine. These wines will be done in time to be described in my upcoming book, Craft Wines to be published by Story Press. Two of our favorite mildly hot cooking peppers are Mexibells and Mole peppers. Mexibells are small, about 3 inches in diameter and ripen early with a nice heat level for adding a whole pepper to a dish for two. Moles are a longtime favorite for me with a smoky, earthy flavor and medium heat. They bear heavily and we’ve just started picking the first ripe ones that have a beautiful chocolate brown color. I’ve often described this as my favorite cooking pepper and have used it several times to make Orange Mole wine that also includes chocolate. 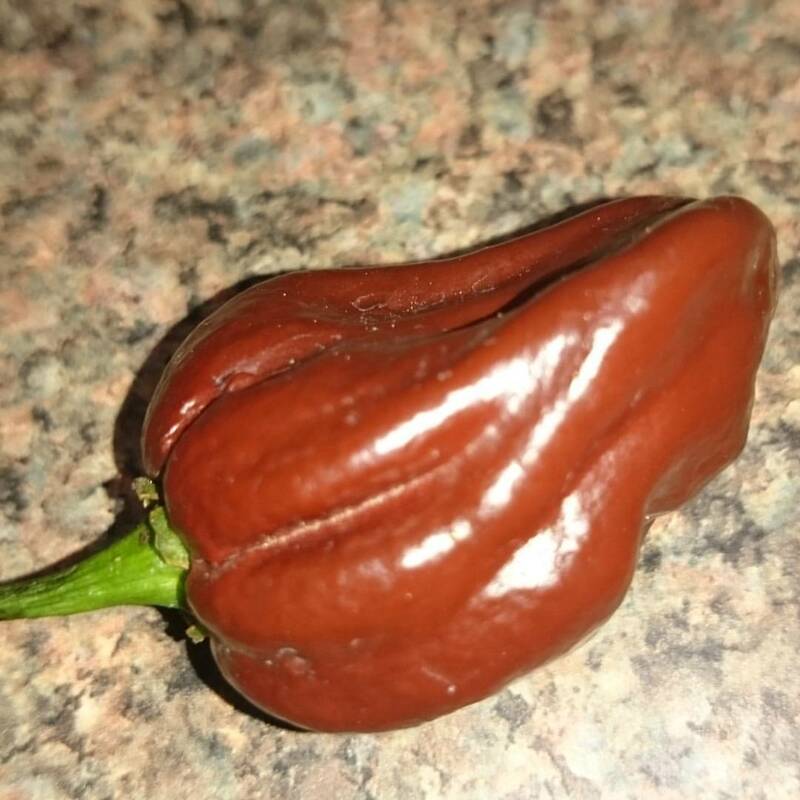 I grew this variety for the first time in 2007 after finding seeds and knowing I wanted to make a mole wine that included chocolate like the traditional Mexican mole sauces. My first mole wine was made in 2008 and it has become a favorite wine in the cellar. Our sweet peppers have also done well with a long time favorite being Gypsy which is a tapered pepper that bears heavily and ripens early with a sweet flavor. This is our second year growing Jimmy Nardellos which is a long skinny pepper which ripens earlier than any other sweet pepper I’ve grown. This is one of my wife Cathy’s favorites. A new one we really like is Aconcagua which is a large, long, tapered pepper that also ripens before typical bell peppers. We will be planting them again. They are a good pepper for stuffing and baking. Our favorite recipe for that is a stuffing made from goat cheese, shrimp, garlic and an assortment of herbs. We’ve had fresh peppers to use daily for over a month now and we will have an impressive harvest of peppers at the end of the season to use in cooking and wines all winter long. The superhots will produce enough to make a 12 gallon batch of wine every year for the next several years, leaving room in the garden to grow new varieties next year. Last year’s superhot, Devil’s Tongue made perhaps the best hot pepper/citrus wine I’ve made out of 30 different hot pepper/citrus wines over the last 23 years with enough Devil’s Tongues left in the freezer to make a couple more batches. All things considered, our pepper garden has been extraordinary this year. This week around home we have continued to harvest lots of tomatoes and beans. Cathy made some green salsa from our garden’s tomatillos. I started a new wine, Plumbarb made from plums and rhubarb. The highlight of the last week was the 2nd anniversary of the day I married Cathy. We celebrated by going on a 3 day trip to Pagosa Springs and Crested Butte. We spent the first evening at The Springs Spa. 18 hot pools along the San Juan River ranged from 97 degrees to 112 degrees. We tried out all of the pools except for a couple of the coolest ones. I jumped straight from the 112 pool and the 109 degree Lobster Pot pool into the cold San Jan River. The second day we visited the Last Chance Mine above historic Creede, CO. $150,000,000 worth of silver was mined there during its heyday. We collected specimens of amethyst, sowbelly agate and native silver. We also found a beautiful opal and peridot ring for Cathy at the mine’s gift shop. We finished the day by watching the sunset over the Black Canyon of the Gunnison in the National Park of the same name. Our 3rd day we went on a wildflower hike above beautiful Crested Butte, spending a nice time sitting on a bench overlooking Judd Falls. We followed that up by visiting quaint little Marble, CO where some of the highest quality white marble in the world was mined to build many of the monuments in Washington, D.C.
We got home late that night the day before our anniversary. Our anniversary dinner was scallops, lobster and ripe shishito peppers in butter sauce. It was a delightful 4 day celebration. I’ve been meaning to start my blog for quite a while and finally decided the time is now. My recent book, about creating and growing bonsai that bear an edible crop, Bountiful Bonsai, is available at Amazon, Barnes & Noble and most local bookstores. After 2 gardening books about bonsai, I’m switching gears a little to write about one of my major hobbies, home winemaking which I did introduce as part of Bountiful Bonsai. I’m about to sign a deal with Storey Publishing to write and publish the book Craft Wines. I will also write about my other interests including rock collecting, fishing, hunting, wildflowers and nature in general. Soon I will also publish an e-book version of my first book, Herbal Bonsai and a collection of philosophical essays titled, Hunting the Wild Quantum: The Adventures of a Hillbilly Savant. I have a 200 case wine cellar going back to 1986 with 137 different wines, only 3 from grapes and several vintages of many of those wines. In particular, I’ve made blueberry wine 10 years in a row. The most memorable of which is a vintage I named Blueberry Bride. My then fiancé, Cathy, stomped those blueberries the week we got engaged and we then served that wine at our wedding reception. My most recent wine is Chamomile, in glass for secondary fermentation and a banana wine currently in primary fermentation. I have several vintages planned to start this fall, including some with hot peppers I am growing in the garden. Stay tuned for updates about my winemaking activities.